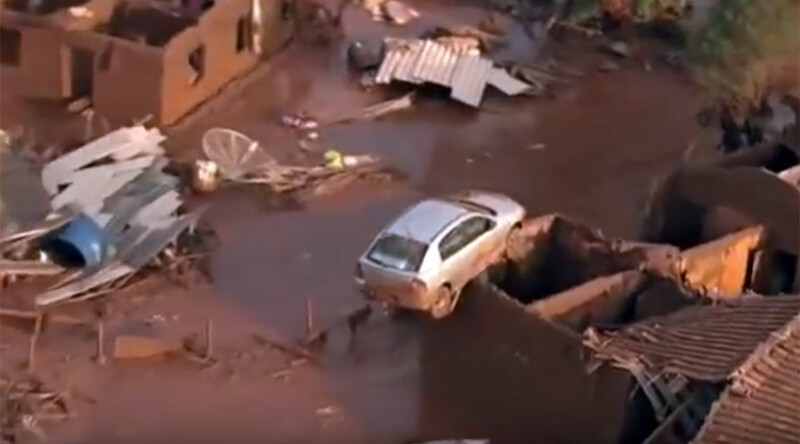 Over a dozen people have reportedly been killed and at least 45 more are missing after a dam burst in the southeastern Brazilian state of Minas Gerais. Social media images show grave devastation, as rescue operations and evacuations are underway. At least 17 people have been killed in the disaster, AFP reported citing firefighters. The dam burst near a working mine in a rural area located about 300 kilometers (185 miles) from Rio de Janeiro, AP reported, citing a statement published by the city hall of Mariana. Witnesses told local media that the town of Bento Rodrigues, with a population of 620 people, has been completely flooded by mud. “An avalanche of liquid waste destroyed houses, a school, a church, a medical center, carried away vehicles. Many families have been left homeless and are waiting for news about their loved ones. The emergency work is hampered by the fact that the flooded areas are only accessible via helicopters. This is one of the saddest scenes I ever had to witness,” the local health ministry head of Minas Gerais state, Juliano Duarte, was quoted as saying by TASS. Rescue teams are on site looking for survivors. The exact number of dead and injured is still unknown. The Iron and Metals Extraction Union said that between 15 and 16 people have been killed and 45 remain missing. Sniffer dogs have been sent to the area to help search for the missing people. Photos and videos from the scene posted on social media show devastation on a large-scale, with houses and vehicles flooded in a pool of mud. Authorities say mudslides are still a risk. People living around the dam were instructed to evacuate and seek safety on higher ground. The mine’s owner, Samarco mining company, confirmed the break in a statement, adding that toxic waste from mining operations had been leaked. It also promised to minimize the damage to local residents and the environment.